Relax. Refresh. Renew. Guests at Jeeva Santai receive complimentary transport to our sister resort, Jeeva Klui, just 1 km from Santai. Our resort host will be happy to assist you with spa reservations. Jeevaniya Spa at Jeeva Klui invites resort guests from Jeeva Klui and Jeeva Santai to restore body, mind and spirit at our intimate oasis. 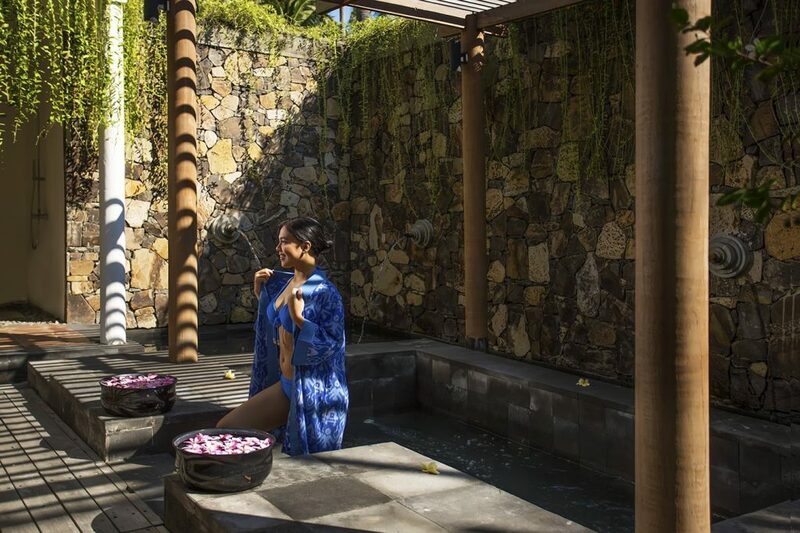 Traditional Indonesian spa therapies mix with Western and Asian offerings to present a spa experience that is more than just luxurious; it’s truly a restorative journey. From treatment rooms overlooking the Lombok Strait and the mountains of Bali to results-oriented therapies ranging from scrubs and wraps to traditional massage, our spa services don’t disappoint. Our adults only spa pavilion features updated spa amenities, new massage and manicure rooms, a cold pool and sauna. Spa hours are from 9:00 am to 10:00 pm daily (last order at 9:00 pm). We offer 30% reduction on all treatments (excluding Signature Rituals) during our daily Happy Hour from 9:00 am – 1:00 pm. As a special evening luxury, we extend each treatment by 15 minutes between 6:00 pm to 8:00 pm. In addition to complimentary transport to our full service spa at Jeeva Klui, we offer a double massage room at Santai exclusively for Santai guests. Choose to enjoy your massage in the spa room or in the privacy of your suite. 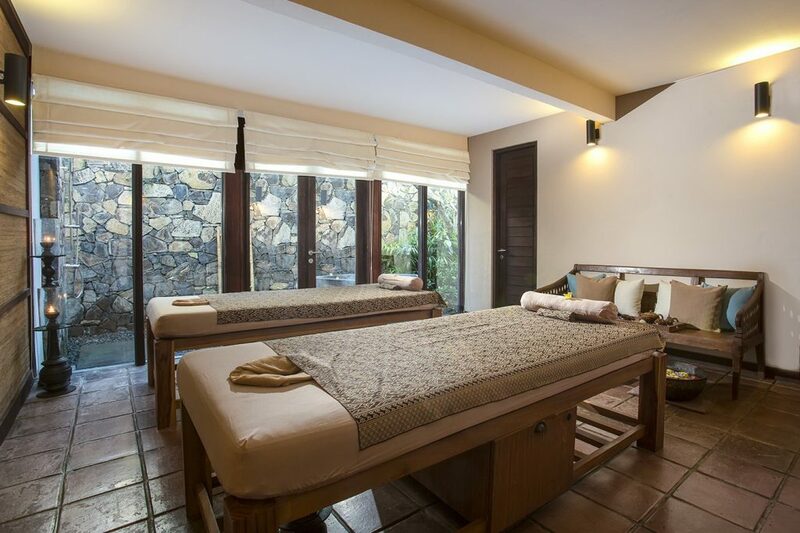 Experience the restorative power of healing hands when you enjoy massage therapies from Jeevaniya Spa at Jeeva Klui. 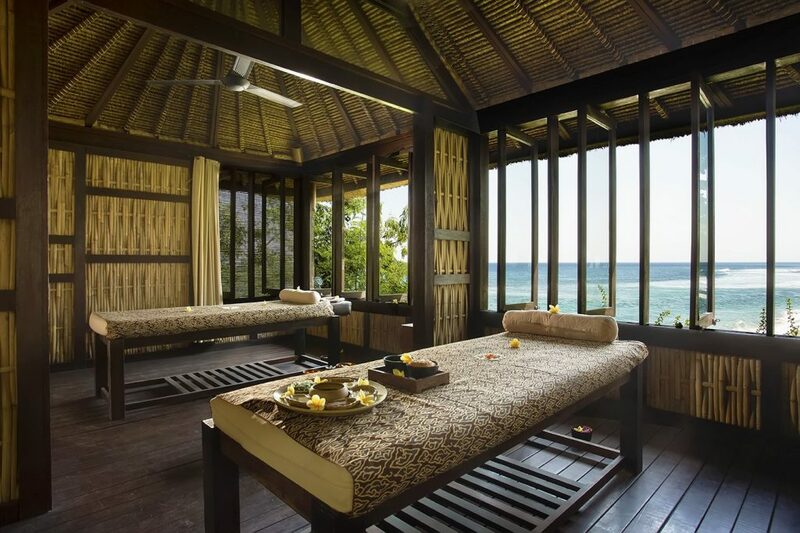 Our full-service luxury resort spa offers two intimate couple’s treatment rooms as well as two individual treatment rooms, each with views along our stretch of private beach and across the Lombok Strait to the mountains of Bali. Spa attendants have been specially trained with Indonesian traditional massage methods and techniques. Choose to enjoy your services in the spa pavilion, in the privacy of your suite, or in a beach cabana. Our new fitness center is open! With so many outdoor activities, it’s a wonder that guests would ever want to come inside. 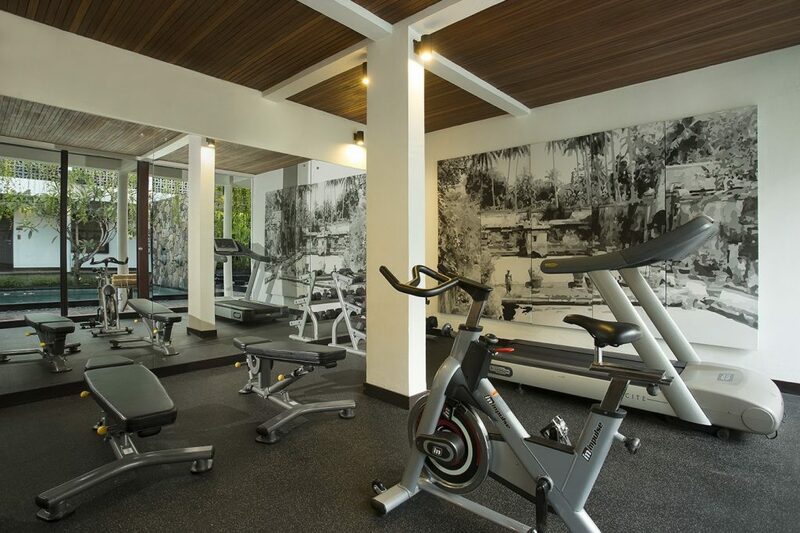 However, our luxury resort now offers a boutique fitness center for those who might prefer a more traditional workout, offering a well-equipped mix of cardio and strength training equipment. Jeeva Santai guests receive complimentary transport to Jeeva Klui to enjoy the fitness center. Please let us know if you require personal training or one-on-one assistance. We’re more than happy to assist with your every wellness need. A luxurious full-body massage using several kinds of techniques including long strokes, gentle kneading, and rolling of skin and muscles to relieve stress and tension and leave you oozing with a sense of well-being. The treatment improves circulation so that your organs and skin receive more oxygen leaving you feeling serene and relaxed. If you feel tired and tense, and you’re thinking of getting a treatment to hit all the right spots, this treatment is specially designed to relieve muscle tension and ease joints. Using deep tissue thumb pressure and strong kneading techniques, our therapist works on your tired muscle spots from your calves all the way to your back, shoulders and neck area. A pressure point massage focusing on zones of your feet, based on the belief that each part of the human body is interconnected through the nervous system of the feet. The aim is to stimulate specific reflex points in order to promote relaxation and healing elsewhere in the body – a great treatment to have after being on your feet all day. Hands and feet are soaked, nail cuticles trimmed and buffed, exfoliated, massaged and finished with a polish of your choice. We offer OPI’s new gel color, a long lasting color applied to natural nails that’s extremely durable, yet soluble. And even better, waiting for polish to dry is a thing of the past! The polish is quickly cured under a UV lamp. Traditional massages from the archipelago that have been handed down from generation to generation. Your treatment starts with a warming “simplified jamu drink” and a refreshing therapeutic footbath. Body exfoliation and moisturizing using fresh local ingredients. The treatment concludes with either a banana leaf body wrap or a yoghurt mask. Avocado is high in monounsaturated fats and Vitamin E making it the best natural moisturizer and the perfect solution for dry skin. Helps to delay the aging process. Papayas are rich in Vitamins A, B, C and E, providing a great antioxidant and essential enzymes that promote skin renewal. The papaya’s beta-carotene also serves as a skin protector, as well as promoting elasticity. A healthy addition to sunburn protection. Caffeine in coffee when applied to the surface of the skin acts as a vascular restrictor that helps to reduce varicose veins, as well as decrease the formation of cellulite. A wonderful skin nourishing treatment with the addition of freshly milled Lombok South Sea Pearls. Saltwater pearl powder helps to slow down the development of melanin (colour pigments of the skin) and acts as a natural sun block and moisturizer. A powerful exfoliant for creating a rejuvenated and silky complexion. Freshwater pearls promote cell renewal, enhance skin elasticity, regulate skin discoloration, as well as protect from environmental radicals. The pearl’s balancing properties leave your skin feeling smooth and refreshed. Honey: strong anti-inflammatory agent that can prevent and reduce infection, offers antiseptic, antioxidant and cleansing properties. Cucumber: an excellent source of silica, a trace mineral that supports our connective tissues resulting in a youthful skin appearance. A good treatment for sun-damaged or dehydrated skin. Candlenut: oil contains essential fatty acids that are vital to healthy skin metabolism, provides a natural light and fast absorbing moisturizer and gently lifts debris from delicate, dry skin. Lime: rich in vitamins and natural acids to help peel away dead skin cells and even out skin tones. Banana: rich in vitamins, minerals (calcium, magnesium, iron, zinc and folic acid) and antioxidants that moisturize and exfoliate, provides anti-acne action and slows down skin’s aging process. Egg white: high in protein and contains lysozyme enzymes, known for skin clearing properties. A natural cleanser that tightens pores resulting in a firming sensation. Choose from our luxurious selection of relaxing massages. Your therapist will ensure that your personalized treatment is individualized to your specific needs. This distinctive massage technique is rooted in the Asian philosophy of yoga. Muscles are stretched and kneaded to energize while keeping the muscle supple. The guest remains clothed during the massage, which takes place on a futon. Shi means finger and atsu means pressure. Shiatsu is a Japanese finger pressure massage technique that utilizes acupuncture points. Energy lines and centers are gently manipulated to reactive your metabolism and restore harmony. You will experience this as a general feeling of wellness throughout your body. The guest remains clothed during the massage, which takes place on a futon. Based on the most traditional local techniques, the Ngurut Sasak combines kneading, long strokes with stretching, acupressure, rolling and pressure techniques. The massage improves circulation and enhances your “qi”, the center of energy. A massage to calm your senses that relaxes the entire body. Recommended only for those who are accustomed to very strong therapeutic pressure massages. Treat the one you love to a surprise wellness indulgence designed especially for couples. A foot bath ritual and soothing Jeeva Revive body massage begins the treatment. Customized body masks designed for feminine and masculine skin follow, then continues with an herbal bath. Your treatment culminates in the choice of a manicure or pedicure for perfectly groomed nails. The ultimate personal decadence. This impossibly romantic experience is luxurious and rejuvenating. Start with a soothing foot bath ritual to revive tired feet and prepare you for a Balinese massage with an avocado scrub to restore youthful shine. This is followed by a milk bath, leaving you calm and peaceful before the final part of your treatment, a fresh fruit facial to restore suppleness to your skin and leave you feeling completely refreshed. All treatments done side by side and followed by a healthy set lunch at the Waroeng. Sea salts supply essential nutrients to the muscles, help to prevent muscle cramps, exfoliate dead cells and moisturize. Betel leaves provide an antiseptic and aromatic stimulant. Caffeine in coffee when applied to the surface of the skin acts as vascular constrictor that helps to reduce varicose veins, as well as decrease the formation of cellulite. A wonderful skin nourishing treatment with the addition of freshly milled Lombok South Sea Pearls. Saltwater pearl powder helps to slow down the development of melanin (color pigments of the skin) and acts as a natural sun block and moisturizer. A powerful exfoliant for creating a rejuvenated and silky complexion. Soak in a blend of pandanese, sandalwood, vetiveria, lemongrass, capulga, citrus skin and flower petals: perfect aromatic relaxation therapy. All Jeevaniya Signature Rituals include a spa souvenir. The denouement of the ritualistic journey. Choose from our luxurious relaxing baths. Soak in a blend of pandanese, sandalwood, vetiveria, lemongrass, capulaga, citrus skin and flower petals: a perfect aromatic relaxation therapy. Elevate your bathing ritual with a milk and honey bath. The gentle cleansing milk is rich in nourishing vitamins.